Install a 2-Piece Strap | Redux & Co.
Start your music, sip your drink. Place your watch face down on a soft cloth on non-scratch surface to protect the crystal and bezel — if you care about things like that. Find the spring bar holes on either side on the outside of the lugs (right next to where the strap connects to the watch). Use the needle end of your strap change tool (or a pin if you’re Macgyver) to push inward to depress the ends of the spring bar inside the lug holes. As you push the tool in, use your other hand to gently slide the strap slightly to release the spring bar from the lug. *ATTENTION: Don’t tug on the strap too hard or tension on the other end of the spring bar could launch your springbar into a galaxy far far away. Once both ends are released, slowly slide the strap free of the lugs. Repeat on the other end of the case. Slide spring bars into your new strap so both ends stick out evenly. 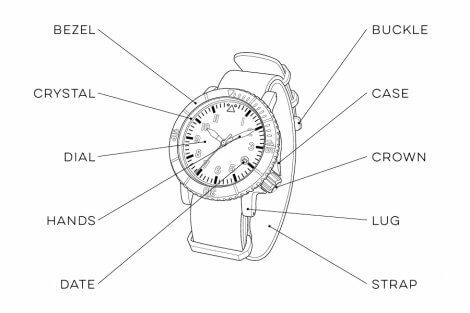 With the watch upside down, fit one end of the spring bar into one lug hole. Hold the other protruding end of the spring bar against the opposite lug, roughly lined up where the hole is. Flip the needle point tool end to the flat head side. Pinch the needle point end, pull it out, switch it around so the flat head side faces out. Use the flat head of the strap change tool (or small screwdriver or knife or you get the idea) and push in on the very end of the spring bar so it can slide in between the lugs. Push the bar in against the strap until the end of the spring bar slides down inside the lug. Carefully move the strap up and down until you hear the spring bar click into its hole and ensure a secure fit. Strap that watch on with the new strap installed! Then file a field report of your COURG in action. ***PLEASE NOTE: Once a strap has been installed and worn (leather creased, dirty, etc. ), returns are not permitted on items which can’t go to inventory for resale. So, please ensure the strap will fit before installing.